History of Licking County - Licking County Library's Wiki! 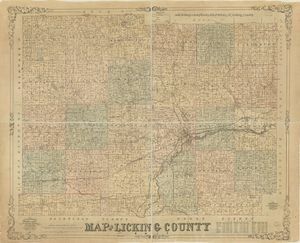 Licking County is located near the geographical center of Ohio. It is divided into 25 townships and contains 5 cities. There are 11 villages and dozens of unincorporated communities. Over the course of time, and due to the development of larger urbanized areas, Licking County is home to many ghost towns as well. The Prehistory of the county dates back nearly 14,000 years when the last Ice Age began to end and the climate began to get warmer, bringing animals and humans to populate the area. The Mound Builders were some of the first people to more permanently settle the area. Early manufacturing efforts in Licking County were begun by the Newark Machine Works, established in 1850, which manufactured portable engines and saw mills until the outbreak of the Civil War. Other strong manufacturing production came from the Wehrle Stove Company, the E.H. Everett Glass Works and the Heisey Glass Company. In 1871, the Baltimore and Ohio Railroad headquartered its stops in Newark, making it the largest shops on the route west of the Allegheny Mountains. Licking County's bicentennial was celebrated in 2008. Many events and activities were arranged so citizens could celebrate 200 years of history in Licking County. ↑ Alrutz, R. (Winter 1993). How Licking County Got Its Name. The Historical Times, 1-1. ↑ The Founding of Licking County. (1924, February 6). ↑ 4.0 4.1 4.2 Rutter, C. (2008, January 1). A Brief History of Licking County. Retrieved March 27, 2015.